I have realised in the last week or so, how absolutely exhausted I am! I guess in the heat of the moment, adrenaline pumping and the reality that it has to be done, you plough on. It’s only when it’s all done and you finally take a breath that it hits you. Sheer and utter exhaustion! I have been pottering around the house working on little projects and then the realisation dawns on me that I haven’t made dinner, haven’t photographed dinner, have no clue what’s for dinner and it’s 7 pm! This explains my week and my lack of presence. I hope you all had a great weekend and are off to a superb start for the week. I thought I’d share some photos of our Father’s Day hike to St Mary’s Glacier and a quick recipe for some incredible Citrus Pomegranate Chicken that I made for our picnic lunch. My husband loves picnics but we never seem to have much luck with the weather. Whenever we plan a picnic, it’s either so windy that our food and plates start flying, so cold that we have to huddle together for warmth or as was the case on Sunday, we start hiking and it starts hailing and the temperature plummets to 48℉ (9℃). The white stuff falling and on the ground in the photo below, is hail. I love rainy and cold weather so I didn’t mind at all. It made a wonderful change to the searing temperature down in Denver. I am so lucky to be able to escape the heat when I want by driving up to the mountains and cooling off. It really is a blessing to live here surrounded by so much natural beauty. St Mary’s Glacier is part of the Rocky Mountains (but it’s on private land) and you are able to hike up the glacier, sled or ski down it. It’s about an hour outside of Denver, so it’s very close to us. At the base of the glacier is a serene lake surrounded by the most intriguing twisty trees. In the summer time and especially when it is sunny, it is beautiful up there. The lake is clear, crisp and cold from the melting snow. My photos do not do the glacier and the glacial lake any justice because it was so cloudy and grey on Sunday. The hike up to the base of the glacier is a bit strenuous if you are not used to hiking but it can be done! The terrain is a bit rocky and you do have to watch your step and have proper shoes. I am not sure how the people wearing Vans didn’t slip and hurt themselves! I packed a small picnic, nothing too lavish since we had a dinner invitation that evening. We also didn’t want to overeat because we had to lug all the food up there, hiking the rocky terrain and then carry ourselves back down! Hard to do if you stuff yourself! I made some of these Pomegranate Citrus Chicken drumsticks that were marinated in orange, lemon and lime juice, spices and pomegranate molasses. I wanted to grill them but for the sake of time (and exhaustion) I threw them in the oven. We also had some egg salad sandwiches for the vegetarian, fruit and chips (crisps) and granola bars. We ate our picnic on some big fallen tree logs in a wooded area by the lake. The trees protected us from the wind and the occasional rain drop. It was refreshingly pleasant even though it was cold and damp. The last couple of weeks have been so hot in Denver and it was a welcome reprieve to feel winter temperatures again. I know at this point most of you are thinking that I am totally insane for loving the cold, but I do and I often wonder how, having an Indian back ground, that I totally cannot tolerate hot weather. I am going to share my quick chicken recipe and there aren’t any fancy photos today but let me reassure you that the chicken is delicious! 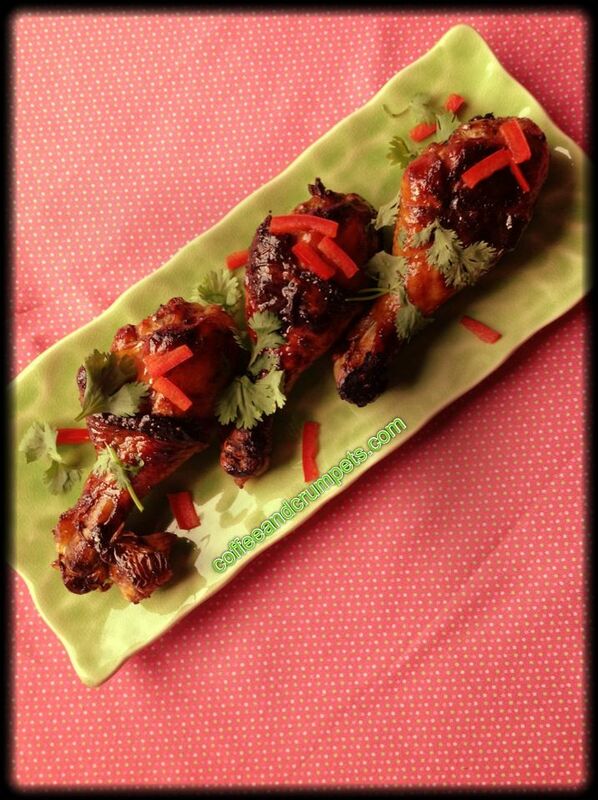 Sweet, spicy and slightly sticky chicken drumsticks marinated with citrus juices and pomegranate molasses. Mix everything but the chicken and oil together in a bowl. Taste to check for salt, sugar and spice. The marinade should be sweet and spicy. Place the chicken drumsticks in a single layer in a large baking dish. Pour over the marinade turning the chicken to coat all around. Place in the fridge and marinate for at least 4 hours or overnight. If using the oven, line a baking sheet with foil and place the drumsticks. Drizzle over the oil and bake for about 30-45 minutes until the chicken is crispy and golden brown. If you desire, half way through, brush some more pomegranate molasses on the chicken to form a sweet sticky glaze. On the grill, toss the chicken with the oil and place on a medium hot grill and cook until golden brown. Brush pomegranate molasses a couple of times to form a sticky glaze. For the picnic I did not glaze the chicken and I did not grill it. To make my life easier and to avoid too much stickiness up in the mountains, I did not glaze the chicken. The marinade can also be reduced to a thick glaze and used to brush on while the chicken is cooking. Season the marinade to your taste. You can adjust the sweetness and the spiciness according to what you like. All in all, it was a wonderful day and the man of the hour really enjoyed his special day. I hope all the fathers out there had an amazing day surrounded by their children and loved ones. That chicken looks absolutely delicious! Looks like you guys had a wonderful father’s day! Take care. Thanks Lail, it was a wonderful day. We enjoyed it quite a bit. Now this a delightful recipe I can try every single weekends 🙂 Didn’t know Pomegranate molasses can make chicken look that gorgeous ! Thanks Nusrat! I was pleasantly surprised too about the colour. It was quite gorgeous! Thanks Kiran! We love the mountains and enjoy hiking the trails. I can’t believe you braved those temperatures for a picnic! I’d love to tuck into that chicken any day, hike or no hike. Hope things are looking up and you’re less tired! I loved the temperature that day! It was so hot in Denver and escaping to cooler climes was just so welcoming. I thoroughly enjoyed the hike. Thanks for stopping by!! Hi Lilly Sue! Yep, its def Colorado but I love it and wouldn’t change it for anything. Thanks for stopping by, its nice to hear from you. What a delicious combination and lovely post! Sometimes I wish I wasn’t a vegetarian! Hi Miss Messy! Oh, you don’t want to be a carnivore, I wish I had enough conviction to be a vegetarian. Hi Shu Han, I hope you see your family soon! Hi, Nazeen! I’m so glad you took the time to comment on my blog as it led me to you! Thanks Min for stopping by and leaving a comment! I hope to see you around. Thanks Suchi! I was never a big John Denver fan but I did watch his funeral years back…it was in Colorado. We had a fabulous day and the rainy, cold weather made it perfect. Wow Nazneen…you live so close to where my brother lives.! What a lovely colour and the dish looks out of the world! I love visiting this space because I find we have a lot in common in terms of flavour choices and preferences.I so love pomegranate molasses for the intense flavour and colour it imparts to a dish. Lovely picnic pictures too…a well deserved break for you! Where does your brother live? Is he here in Colorado? And most importantly, do you ever come to visit?? Thanks Nami! We had a great time. I hope your husband had a good Father’s Day too. Thanks Charlie and yes, he had a good day. We love the mountains and the cool weather so we had a blast in the hail and the rain. It always really good to escape the heat in Denver. I am definitely used to the cooler weather growing up in England and thats why I enjoy it. Sounds like a terrific day! Fun pictures. And great looking chicken – this looks so flavorful! Really nice photos of it, actually – we don’t need fancy to know when something is good! Thanks for this. Thanks John! It was a fun day and I really enjoyed the cold weather again. That’s some stunning scenery… we don’t have any such thing near here, sigh :(. What I wouldn’t give to hike around glaciers! That chicken looks fabulous Nazneen – a perfect picnic food. I usually just cook chicken in a homemade bbq sauce but this pomegranate concoction sounds incredible! Charles recently posted..Midsummer Madness – Swedish style! Hi Charles! yes, it is beautiful here but so is Europe, maybe not Paris, but you have your beautiful scenery. The chicken turned out well but next time I want to grill it. Thanks for stopping by! I’m so glad you didn’t call off the hike and picnic because the weather wasn’t cooperating. Think of all the good times — like Father’s Day — that would have been missed had perfect weather been a requirement. It sounds like your Father’s Day was a good one and I am definitely going to give your chicken recipe a try. It looks fantastic! Thanks for sharing your day and a great recpe. John, there were no signs of thunderstorms in Denver but once we climbed up to 10,000 feet, there they were! We have never cancelled anything for weather, I love rain and snow and have no problem getting a bit wet. My only issue is heat! Substitute the rabbit with chicken thighs and honey with pomegranate, it’s such a quick easy and super healthy dish. I’ll make a batch of these drumsticks though for the weekend. I love your tagine Dave! Has really great Moroccan flavors. I will definitely give it a try since I need to use my tagine again! Thanks Danielle! It was fun despite the weather.I know London weather too well and know what you can encounter!Thanks for stopping by! Denise Browning@From Brazil To You recently posted..Coconut Rolls (Pão Doce com Coco): Life is better with sweets!! Thanks Denise! It was a good time. I hope your husband had a great day too. Thanks Sarah! You should visit CO, I think you will love it! Such lovely nature pictures, love the outdoors! Your recipe sounds incredible, what a dish! Thanks Nat! I love the outdoors too, esp the mountains. I am glad your family had such a beautiful Father’s Day. Love the pomegranate chicken – looks delicious and so different. Yumm! Thanks Minnie! It was a fun day. I hope your husband had a good day too.